Today marks a dark anniversary: the 50th year to the day since the assassination of the 35th President of the United States of America, John Fitzgerald Kennedy. Kennedy’s presidency was of global importance, never more so than during the Cuban Missile Crisis in October 1962, and his assassination generated shockwaves that reverberate to this day. To commemorate his life I’ve chosen a selection of sites in England associated with JFK’s work and legacy, which have been protected under law by the British government. JFK’s father, Joseph Kennedy Sr, served as US ambassador to Britain between 1938-40. At the time of Kennedy Sr’s ambassadorship, the US embassy was based at Macdonald House on Grosvenor Square, London (not listed), to which it had moved in 1938 (the building now hosts part of the Canadian High Commission). JFK visited the embassy on several occasions when he was in the UK during 1938-39 as part of a larger European-wide tour. There is also a (private) plaque with JFK’s name on it outside 14 Prince’s Gate, a terrace overlooking Hyde Park in Kensington Road, Westminster that was awarded Grade II listed status in 1970. Between the 1920s to the 1950s this was the residence of eight American ambassadors in a row, including Joseph Kennedy Sr. It was here that JFK would have lived while based in London in the late 1930s. By the time JFK became President in January 1961 the new US embassy on Grosvenor Square, London had been completed. 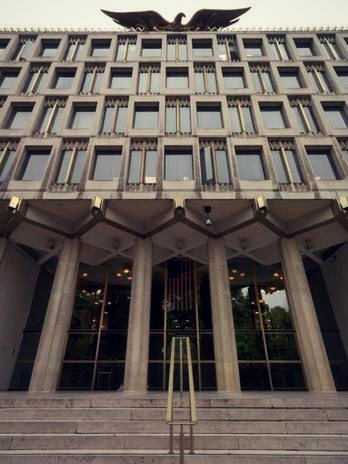 Designed by Finnish-American modernist architect Eero Saarinen, the building was listed at Grade II in 2009. From 1953 onwards the US ambassadorial residence had also changed to Winfield House in Regent’s Park, which was was listed at Grade II in 2001. It was here that JFK would have been based for the two visits that he made to the UK during his presidency. The first of these was in June 1961 when he met with the Queen and the Prime Minister in London; the second was in June 1963 when he met with Prime Minister Harold Macmillan at his house Birch Grove in East Sussex, which was listed at Grade II in 1988. Main entrance steps to the Embassy of the United States of America, Grosvenor Square, Westminster, London. The defining moment of JFK’s presidency to many people was the Cuban Missile Crisis of October 1962. In 2011, two Thor missile sites at Harrington, Northamptonshire and North Luffenham, Rutland were listed (the former at Grade II, the latter at II*). Both sites were raised to high alert during the crisis. In 2013 a bunker at Daws Hill, Buckinghamshire was also listed at Grade II*. Daws Hill served as the UK nerve centre of the US Strategic Air Command between 1960-65, so it would have been a vital link in the command chain between Washington and US aircraft and missiles stationed in the UK throughout the crisis. 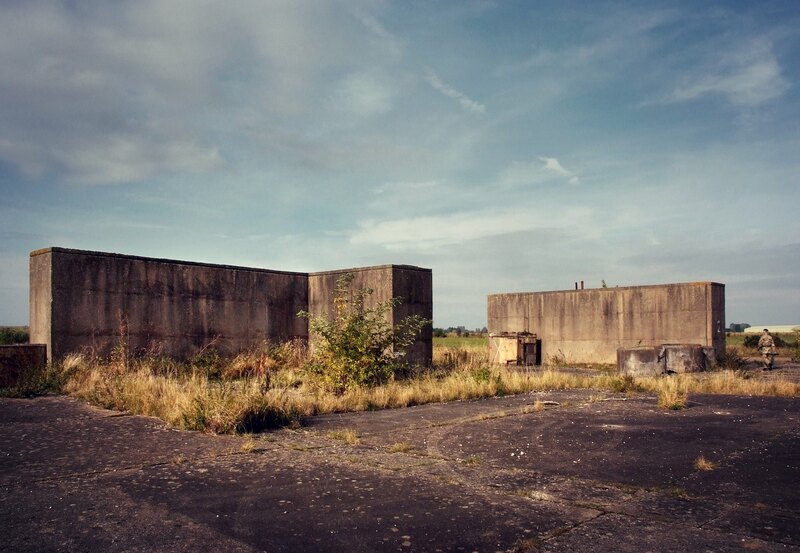 Thor Missile Site at the former RAF North Luffenham, listed at Grade II*. 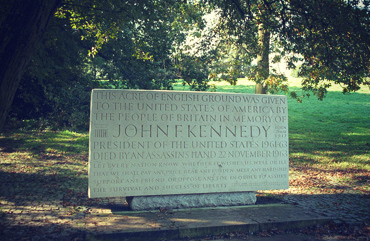 The most impressive built testament to JFK’s life that exists in England comes in the memorial erected at Runnymede near Egham, Surrey, which was listed at Grade II in 1999. Unveiled in 1965, the memorial was designed by Geoffrey Jellicoe and is a 10ft by 5ft Portland stone slab on a granite base. This acre of English ground was given to the United States of America by the people of Britain in memory of John F Kennedy, born 29 May 1917: President of the United States 1961-63: died by an assassin’s hand 22 November 1963. “Let every nation know whether it wishes us well or ill that we shall pay any price, bear any burden, meet any hardship, support any friend or oppose any foe in order to assure the survival and success of liberty.” – from the inaugural address of President Kennedy 10 January 1961. Other memorial sites associated with JFK include the Church of St Anne, Fawley Court, Buckinghamshire. Awarded grade II status in 2009, the church includes plaques in memorial of JFK and also Robert Francis Kennedy, JFK’s brother and former US Attorney General and Senator who was himself assassinated in 1968. There is also Howard Park and Gardens, Letchworth, listed Grade II in 1987, and which includes the John F Kennedy Gardens. A well-known but undesignated commemorative bust to Kennedy is situated in the forecourt of No. 1 Park Crescent at Marylebone, London. The bronze bust is the work of Jacques Lipchitz, a Lithuanian American, and was financed by readers of the Sunday Telegraph newspaper. It was unveiled in May 1965 by Kennedy’s brothers Robert and Edward Kennedy. Other undesignated memorials to JFK include a memorial mural in Birmingham and two schools named after him, the John F Kennedy Catholic School in Hemel Hempstead and the President Kennedy School and Community College in Coventry. Joe Flatman is the Head of Central Casework and Programmes for English Heritage’s Designation Department. Previously he was the county archaeologist of Surrey and a senior lecturer at the UCL Institute of Archaeology. His most recent publications are Becoming an Archaeologist and Archaeology in Society. American Heritage in England: Presidents and Politics – designated places in England connected with US premiers, including JFK. Birch Grove is in East Sussex and JFK didn’t visit the US Embassy during his visit in 1963. Thank you for pointing this out – we’ve made the change to East Sussex.